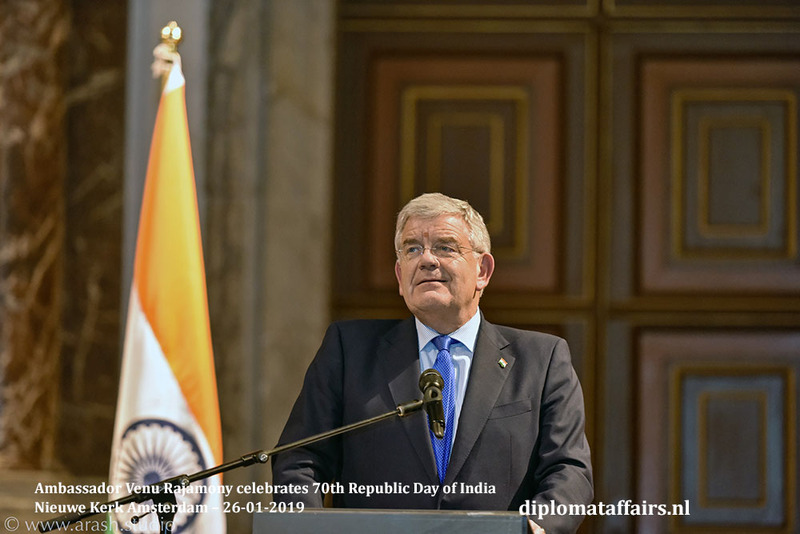 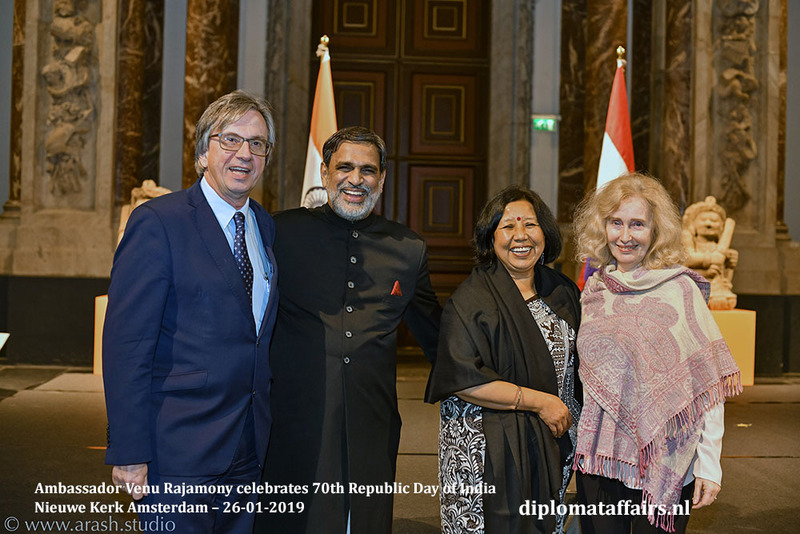 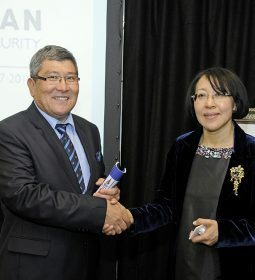 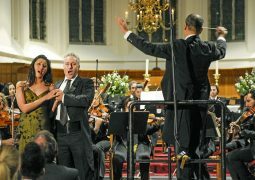 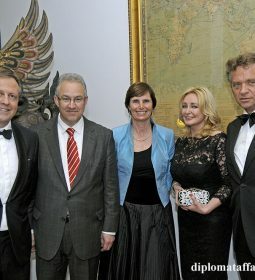 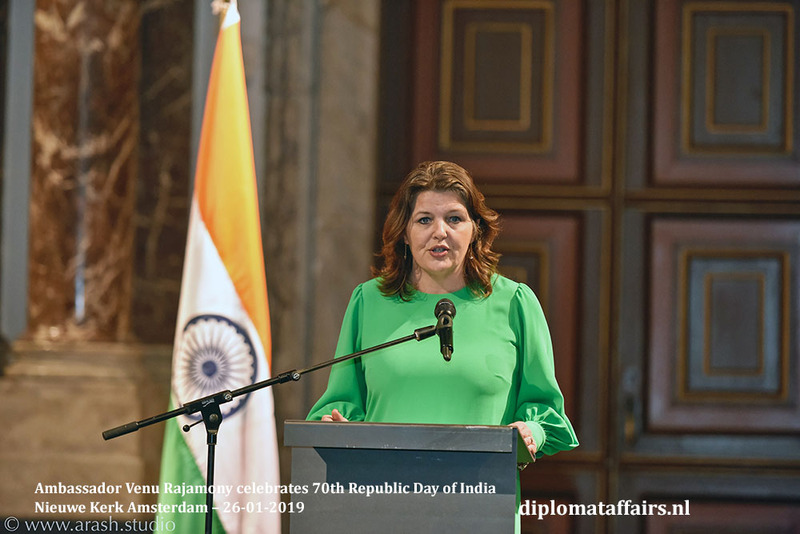 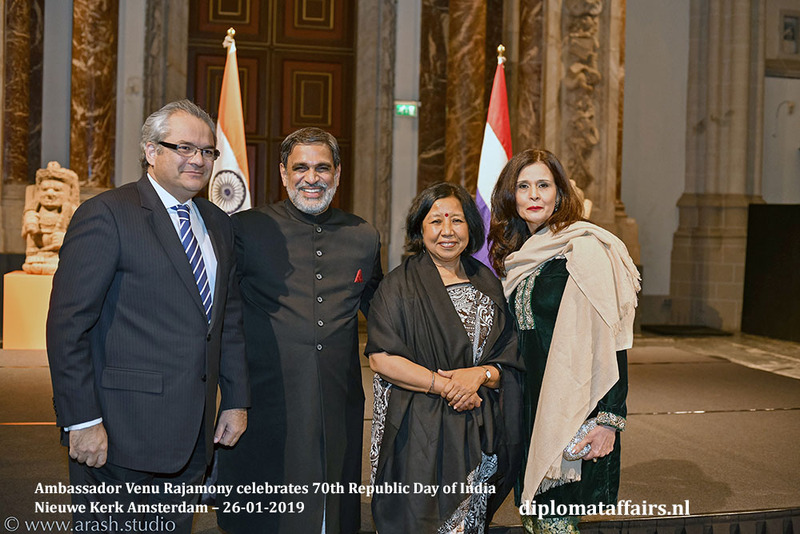 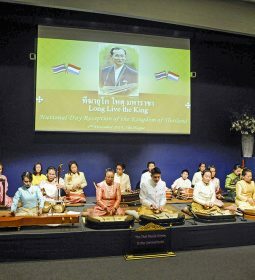 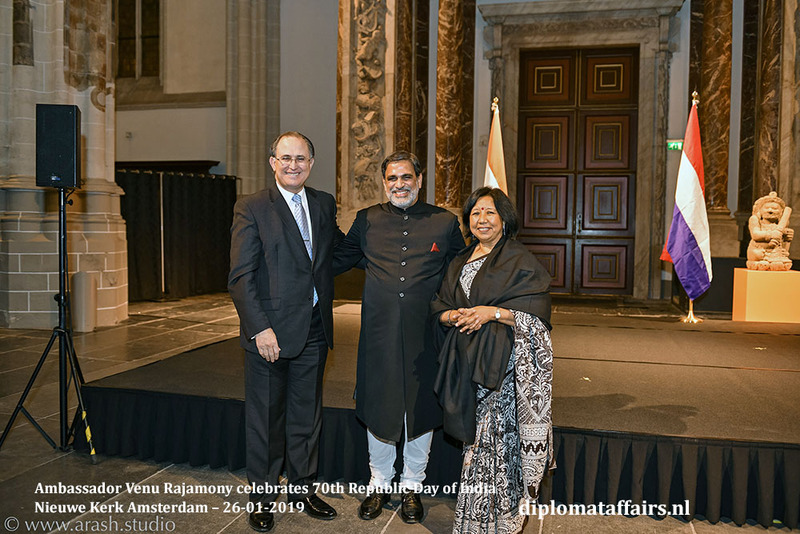 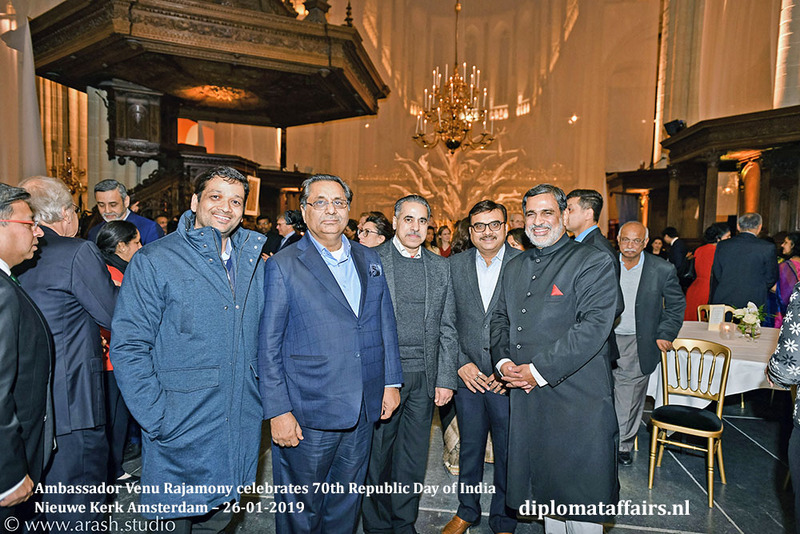 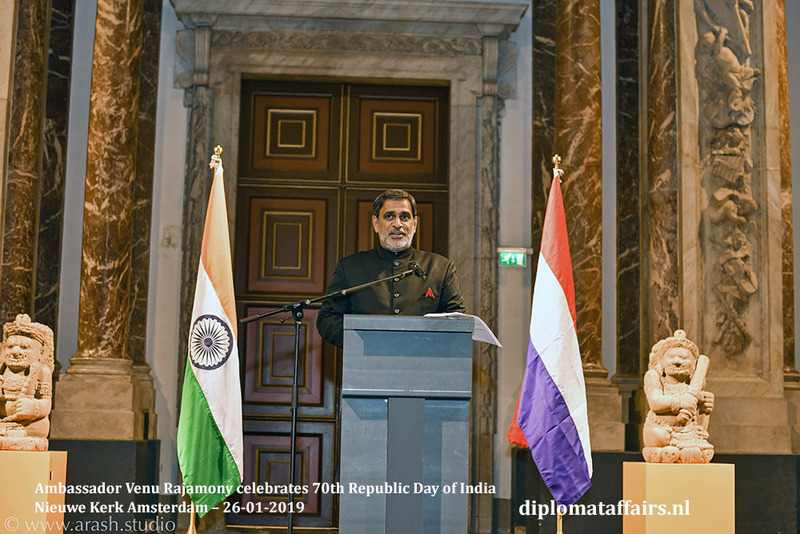 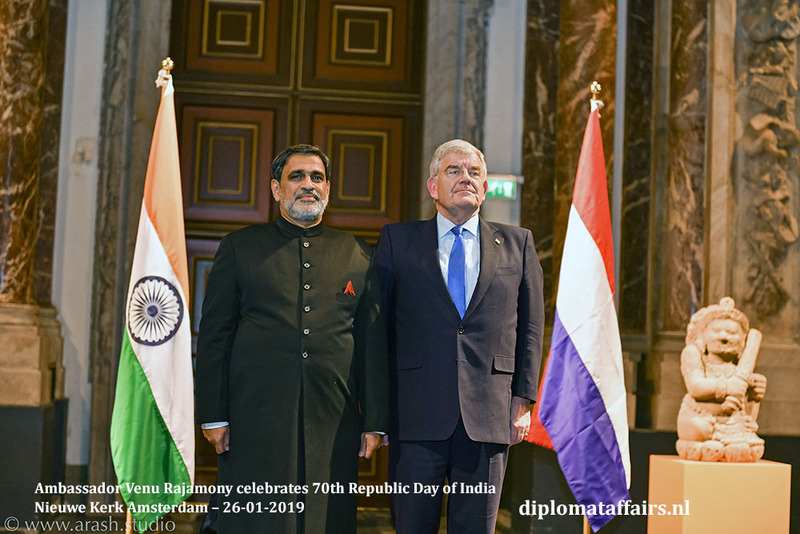 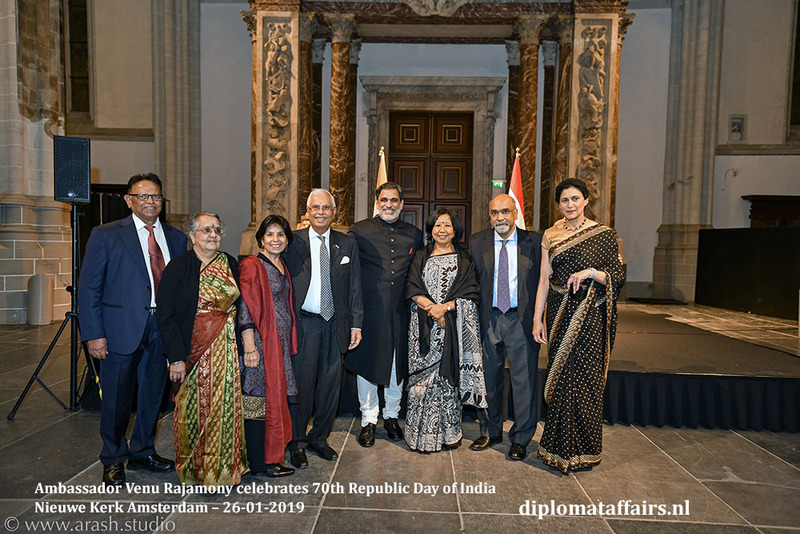 The 70th Republic day of India was celebrated January 26th in the Netherlands. 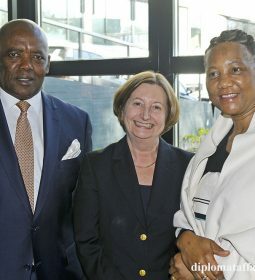 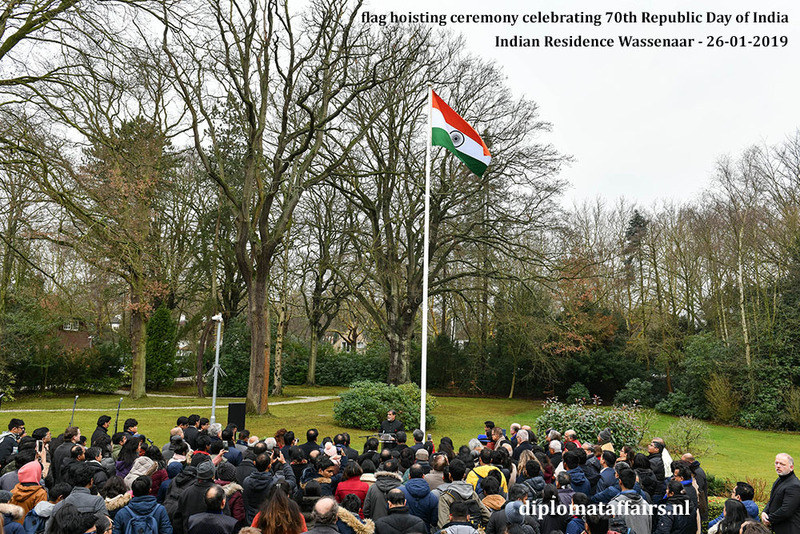 This momentous day started off in Wassenaar, at the Ambassador’s residence where a crowd of over 600 people braved the rain and cold to attend the flag hoisting ceremony. 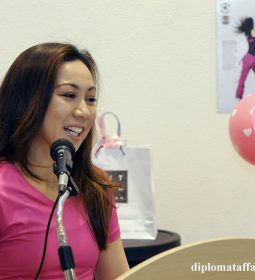 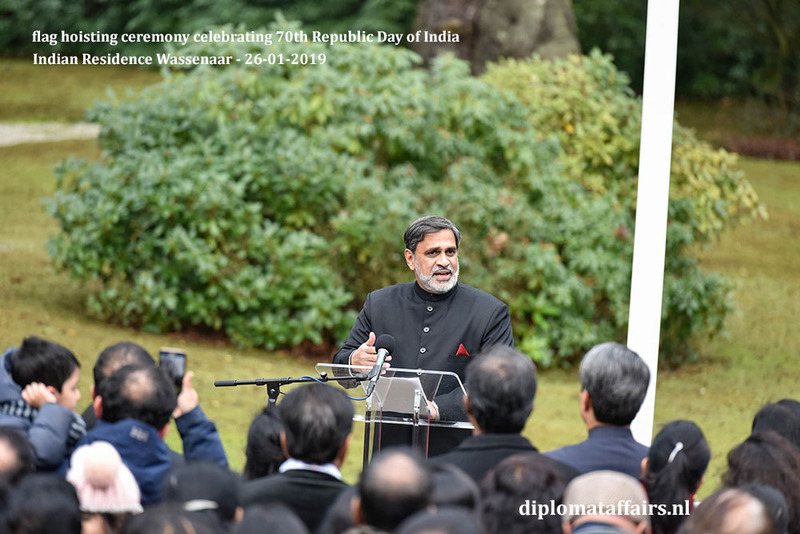 As the flag proudly fluttered in the wind, its colours braving the grey of the day, the National anthem was sung and H.E. 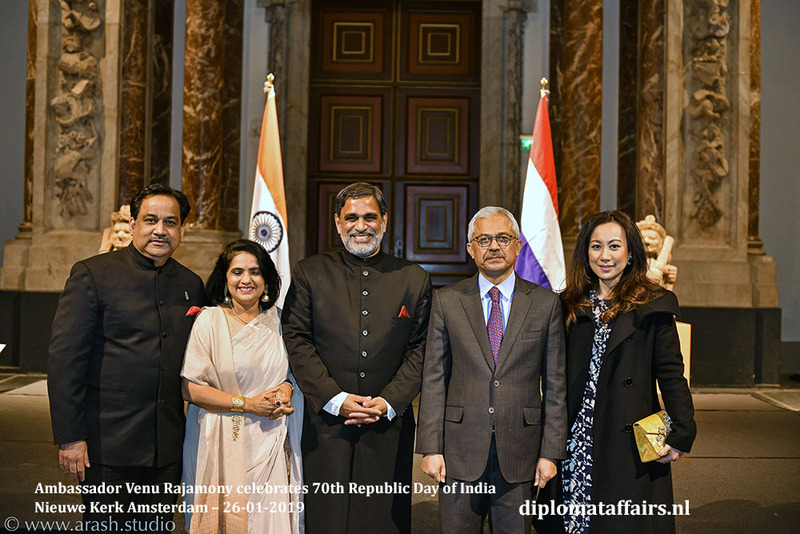 Ambassador Venu Rajamony read out President Ram Nath Kovind’s address to the nation. 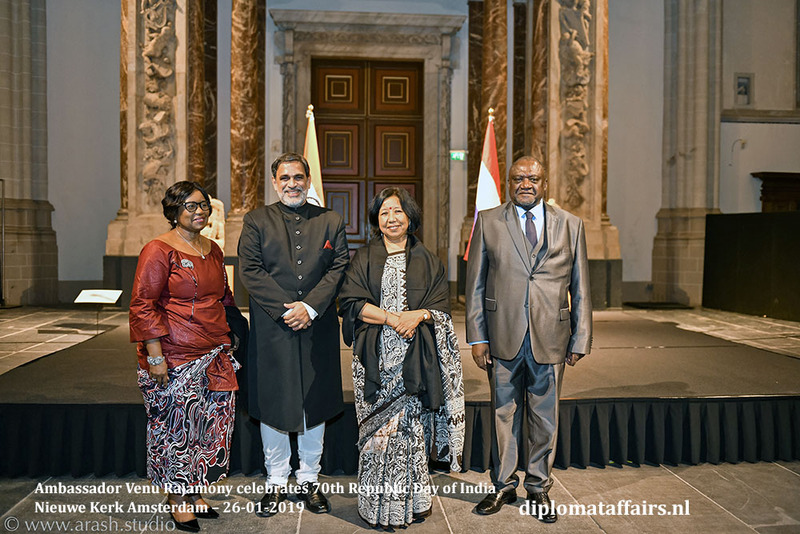 Ambassador Rajamony also made a special announcement that after persistent efforts by the Embassy, the Government of India has decided that, henceforth descendants up to the sixth generation of the original Indian immigrants who had arrived in Suriname (former Dutch colony in South America), and later migrated to The Netherlands may be considered for Overseas Citizens of India Provisions. 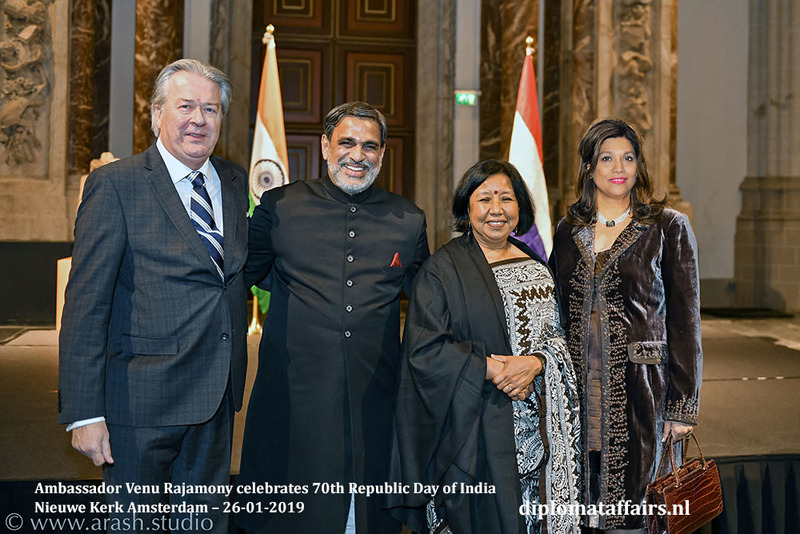 We also learnt that the Netherlands has the largest population of Overseas Indians in mainland Europe, majority belonging to the 200,000 strong Surinami-Hindustani community whose ancestors were taken as indentured labour from India to Suriname 145 years ago. 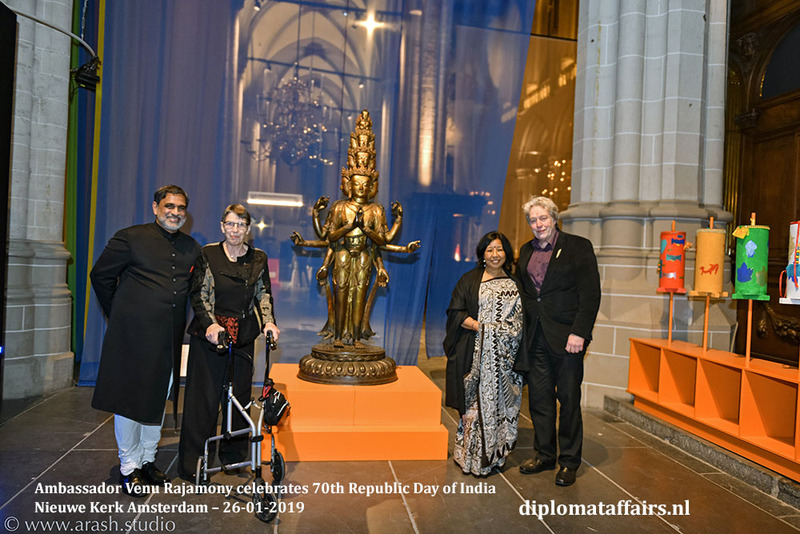 The second part of the celebrations was held once again at the prestigious Nieuwe Kerk in Amsterdam with as guests of honour the King’s Commissioner for Drenthe Ms Jetta Klijnsma and Mayor Jan van Zanen of Utrecht. 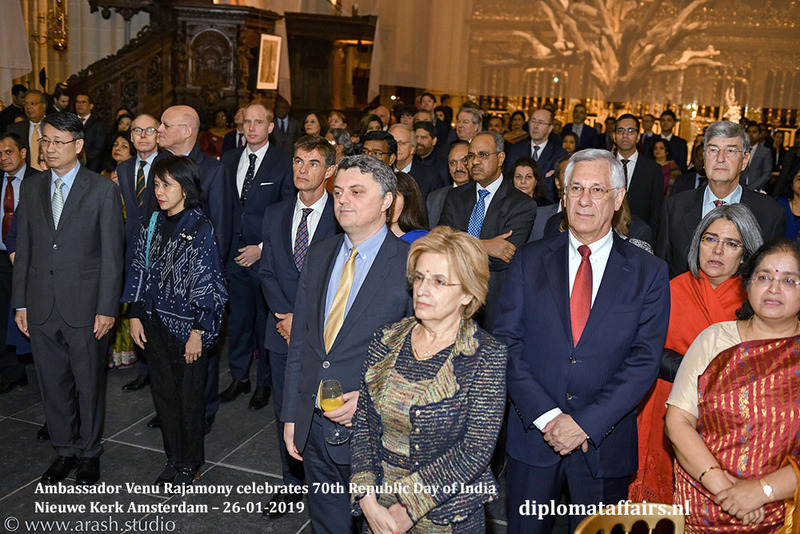 Dutch dignitaries, Ambassadors, government officials and prominent members of the Indian community were in attendance and gathered round His Excellency in the beautifully lit church. 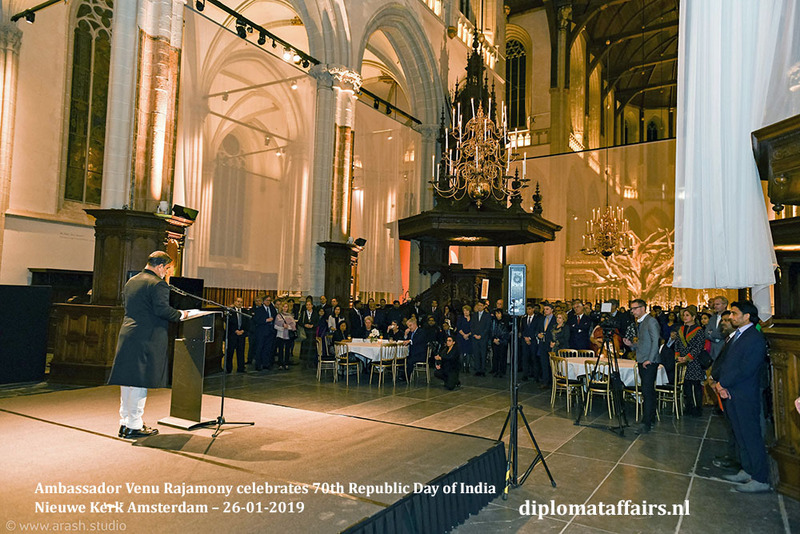 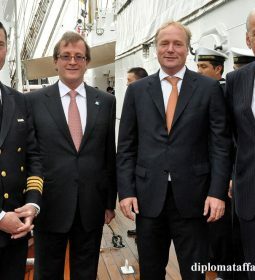 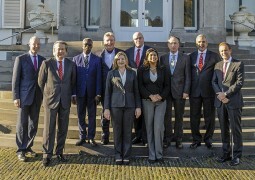 Mayor van Zanen stressed in his speech the strength of the relations between the Republic of India and the Kingdom of the Netherlands which reach back to the pepper trade in the 17th Century. 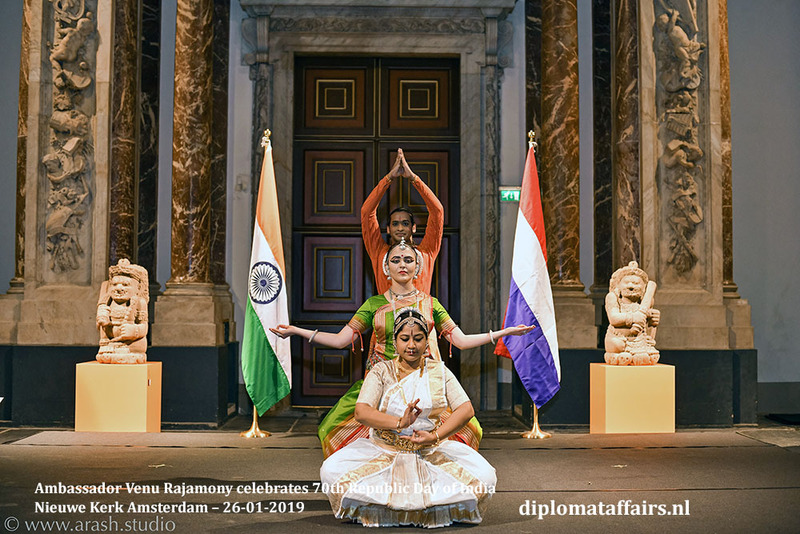 This relation is still as vibrant today with 2018 having seen a flurry of visits and activities between the two countries. 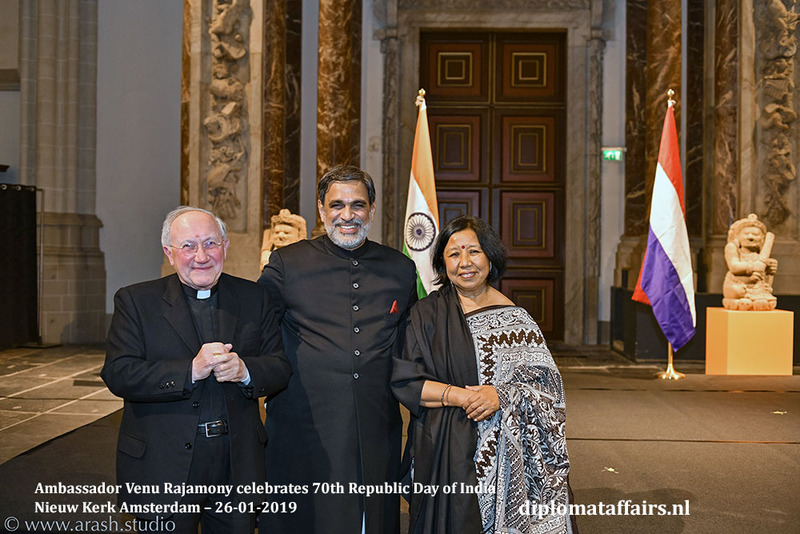 In his speech, Ambassador of India Venu Rajamony touched on the ideals of pluralism and multiculturalism within Indian society, the fact India can pride itself on being the largest Democracy in the world and the importance of the 2019 General Elections. 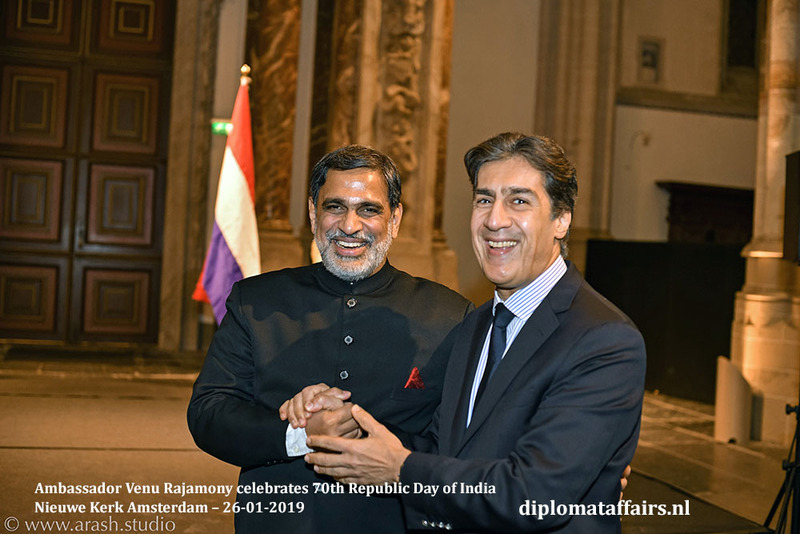 With over 800 million going to the vote ”whatever the outcome”, as the Ambassador said, “these elections will be part of India’s growth story”. 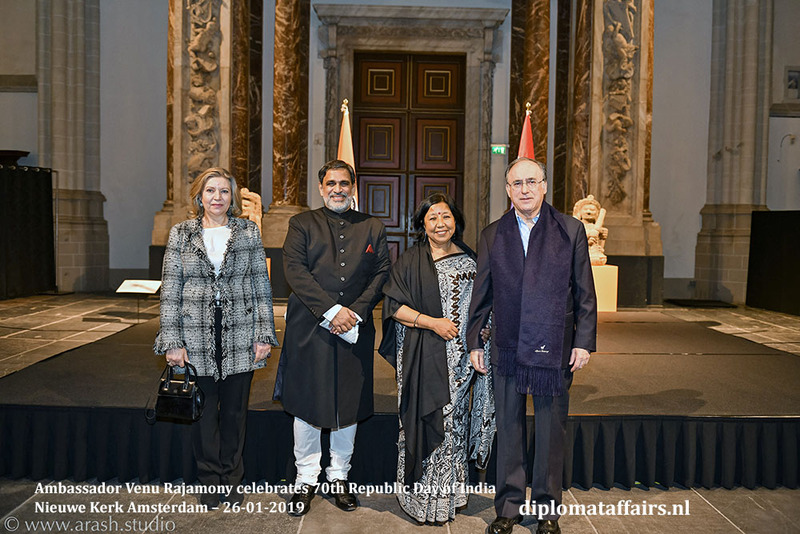 The official part was followed by some beautiful dance performances and an amazing organ performance of compositions by Indian maestros Dr. L. Subramaniam and A. R. Rahman. 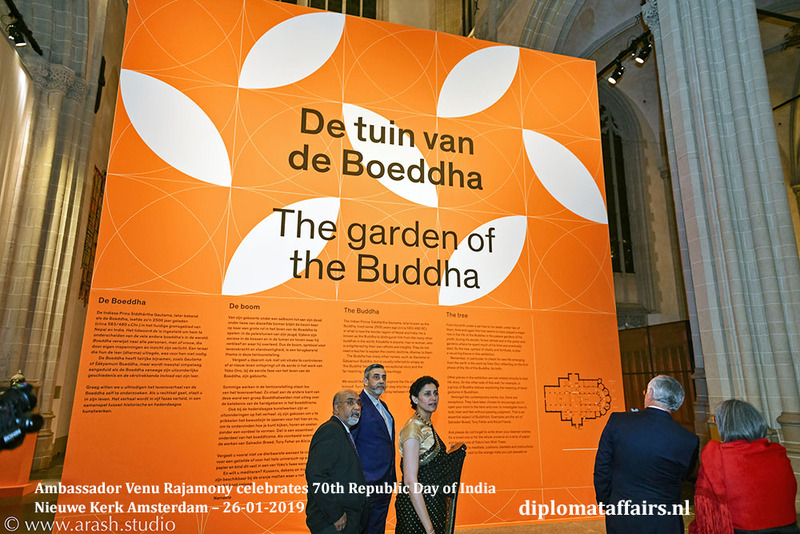 Guests could enjoy the high-profile exhibition ”Buddha’s life, path to the present” bringing together thousand-year old objects and modern art. 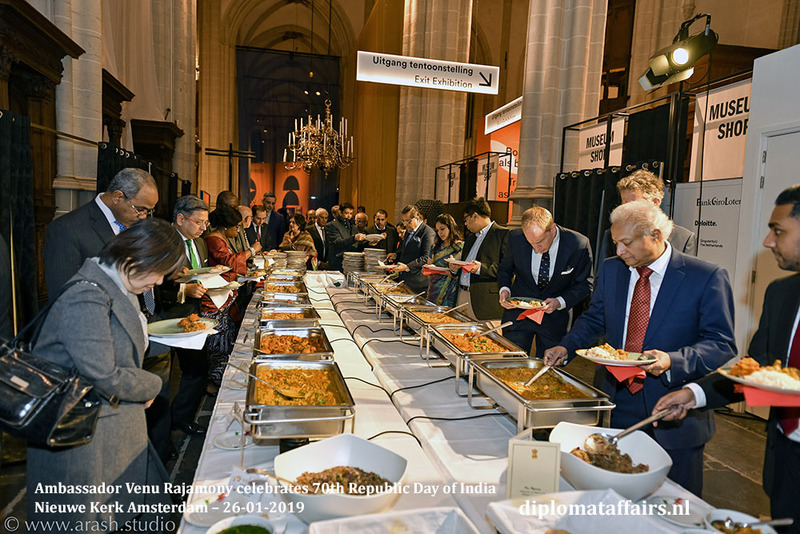 It was a cold day but the warm welcome of the Ambassador and his spouse, Dr. Saroj Thapa and the delicious spicy food from Restaurant Maharani, Noordeinde, The Hague had the guests rapidly glowing with warmth. 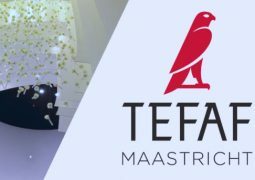 Our departure back out into the cold was softened by a beautiful goody bag of spices, pepper, vanilla and a wonderful selection of natural beauty care products.